When my best friend, who is a huge Bioware fan and general videogame fan in general, wheedled me into buying a PS3 and Dragon Age: Inquisition, I was more than a little dubious. Then the incredibly intricate world and fantastic cast of characters pulled me in and I was hooked! When I discovered I could be an elven character that wasn’t stick thin with long flowing golden locks, I was even more over the moon. Add to that awesome facial tattoos, leather, chainmail, vaguely militaristic styled medieval garb and it was all over. 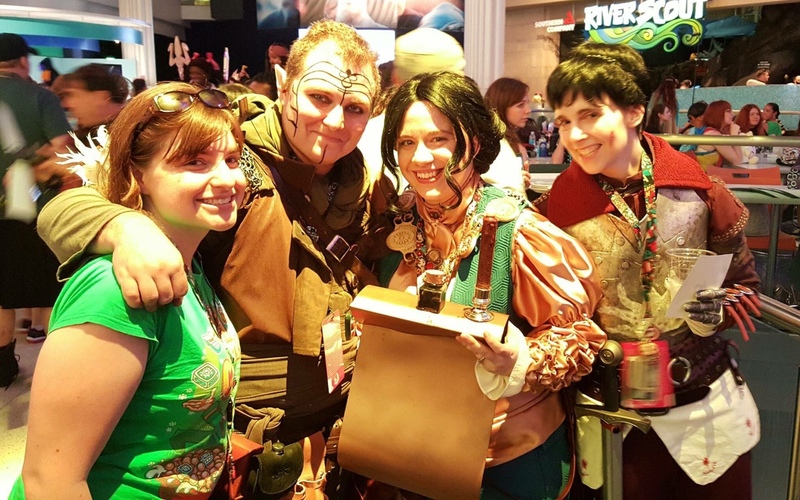 All I needed was a little push and it was fairly simple for my cosplay group to talk me building my Dalish Inquisitor “Mahanon Lavellan” and joining them for a Dragon Age: Inquisition group at DragonCon 2015. In addition to my own cosplay, I constructed my fiancee’s Josephine Montilyet costume as well as assisting on my roommate’s Cassandra Pentaghast cosplay. Of course, I knew my first stop was to Aradani for a pair of ears. This is probably my fourth or fifth pair and I know I’ll buy more in the future. I hit up the booth at the Georgia Renaissance Festival and snagged a pair the summer before DragonCon 2015. Once I had those in hand, I set about actually constructing the props and assembling the garb. 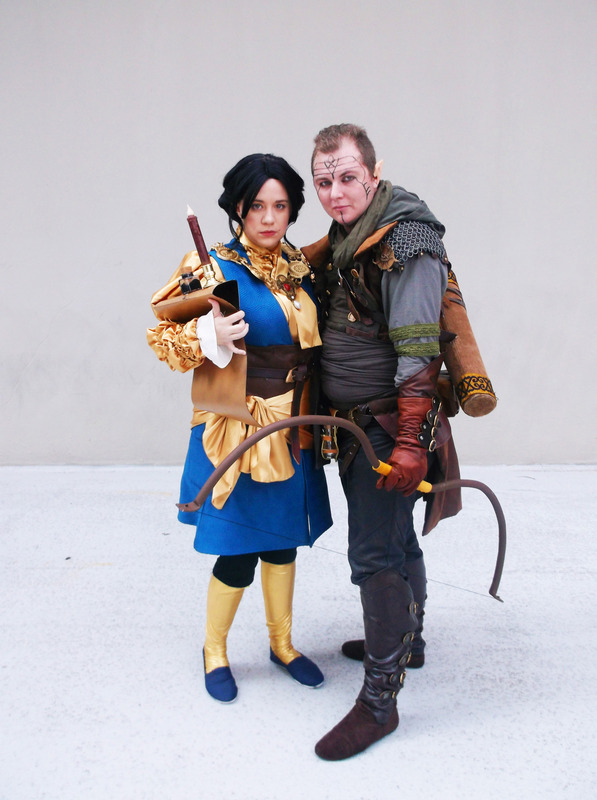 My favourite soft piece of my Inquisitor’s costume was the coat. Even though it was not the highest rated piece of armor in my game’s inventory, my favourite armor was the Scout Armor, which I customised to be a pleasing variety of greens and greys with hints of brown. The design of the coat appealed to me aesthetically and, as no pre-existing pattern matched the design I liked most, I had to pattern it free hand for myself. I actually constructed the coat twice, because I was displeased with the first finished coat. The final coat, although not entirely leather as the actual coat in the game was, brought in real leather elements and hand woven chainmaille shoulder pieces in addition to the three different faux leathers and faux suedes that made up the body of the coat. The two golden Maker’s Eyes that adorn each shoulder were free handed from small leftover pieces of Worbla and painted with acrylic before being distressed with shoe polish and sealed with Mr Super Clear. 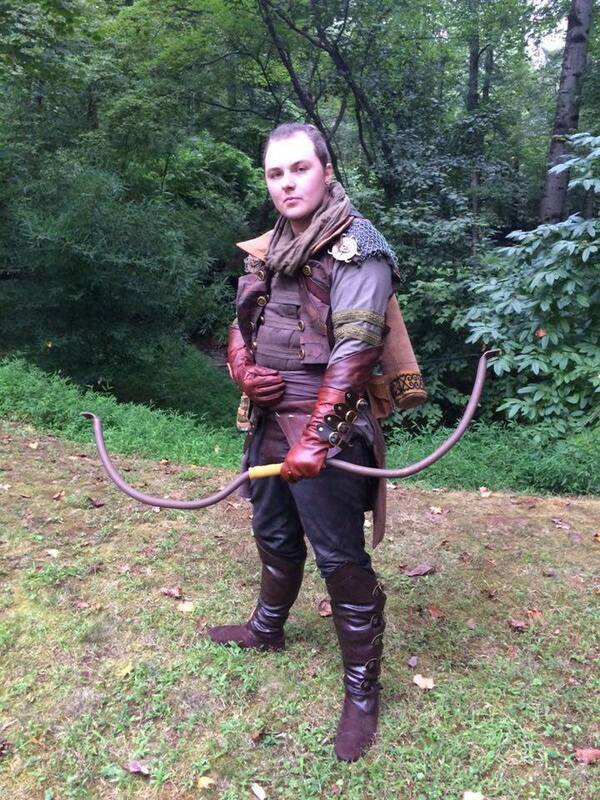 Every piece on this costume was hand made save for the gauntlet bases, leather leggings, and the boot bases. Just about everything that I had to construct was free hand patterned, including the vinyl buckled boot covers and buckled gauntlet extensions. Once I had finished constructing all of the soft pieces, I set about distressing and aging them all to look worn. My favourite distressed piece actually has to be the leggings/pants, as they started life as light brown/grey smooth leather and wound up with a beautiful mottled black/brown, which I achieved by lightly applying black shoe polish and quickly buffing it out. I have begun branching out from just making costumes to making more props and leather accessories. For Mahanon, I needed to construct a fairly distinctive looking quiver that would be lightweight and durable enough to withstand the rigors of DragonCon crowds. The base of the quiver was heavy duty interfacing (most popularly used for the bottoms of purses) which I covered with real suede, salvaged from an old fringed cowboy shirt and adorned with wide home décor trim. To attach it to the costume, I recycled a well loved leather thrift store belt and attached it to the quiver with heavy duty fake sinew. To fill the quiver, I purchased about twelve dowel rods, cut them to size, cut a nocking point, stained and sealed them, and applied my own goose quill fletching before setting to work on my bow. 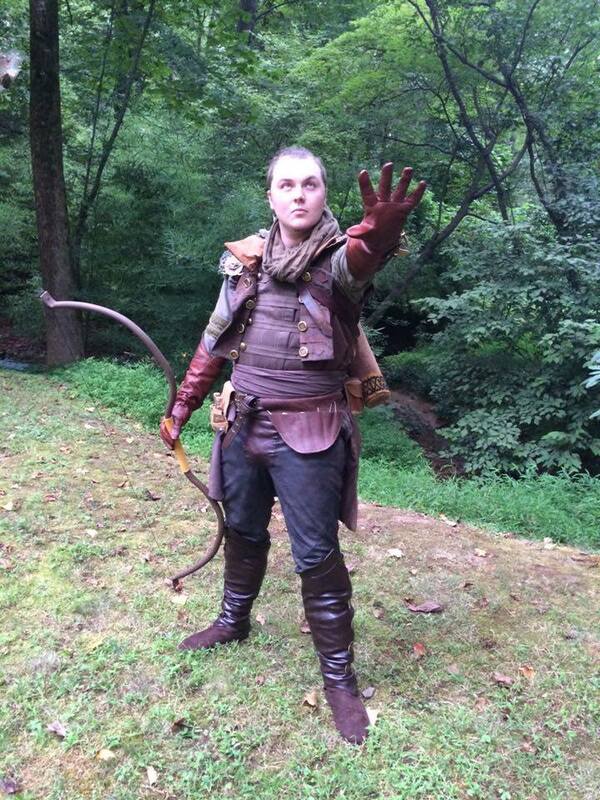 I had recently seen a lot of amazing work for various peoples’ Tauriel and Legolas costumes done using PVC pipe and a heat gun so I wanted to try my hand at this method of creating functional bows. Once I played with my materials and experimented for a while and learned just how much time and heat to apply, I carefully heated up and made my own re-curve bow. Once it cooled, I painted it with brown acrylic and set in a bowstring. Once application day at DragonCon came, I strapped, buckled, and buttoned all my layers on and pulled out my makeup kit. I am highly highly allergic to most, if not all makeups and makeup related things, so naturally just about every costume I fall in love with involves LOTS of makeup. Luckily, this costume was on the light end of makeup application. After applying a base of Makeup Academy sealant to keep the worst of the skin irritants away from my poor face, I used Pros-Aide in place of spirit gum (as no matter how much sealant and allergy medication I take, spirit gum causes me to break out, turn lobster red, and sneeze) to apply my Aradani elf ears. Once those had dried and been double checked by my resident hair and makeup guru (who also happens to be the girl who dragged my not altogether reluctantly into the world of Thedas), I touched up the join with a bit of liquid latex and used Revlon Photo Ready foundation to even out my naturally reddish complexion and the flesh-tone of the ears. After that, another layer of sealant and a free-handed facial tattoo applied with liquid eyeliner! This costume was so much fun to make, a lot of fun to wear, and actually one of the most comfortable things I’ve worn in a long time for a convention. I was so glad that Aradani had what I needed and I will probably be buying a few more pairs along the line to reboot this costume with better materials and new knowledge. I know Aradani is on the ball as far as what awesome fandom is coming down the line and will be the place to go for not just makeup and makeup supplies, but general costuming and costume supplies. This is a Aradani Sponsored Cosplayer Article. Want to get sponsored? Click here.